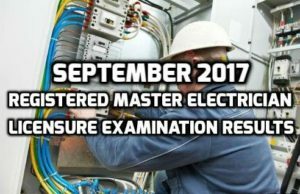 From the recent announcement of the Professional Regulation Commission (PRC), the board examination results include the September 2017 Registered Master Electrician (RME). According to the commission, 3,864 took the scheduled board exam last September 4, 2017. From these applicants, 2,643 passed the examination held at the designated test centers in Baguio City, Cagayan de Oro City, Cebu City, Davao City, Iloilo City, Legazpi City, Lucena City, Manila, Tacloban City and Zamboanga City. The PRC released the successful names of passers after three working days of the final board exam. The commission Board of Electrical Engineering administered the examinations headed by Chairman and Engr. Francis V. Mapile and assisted by member Engr. Jaime V. Mendoza.